Compensation is the human resource management function that deals with every type of reward individuals receive in exchange for performing organizational task. 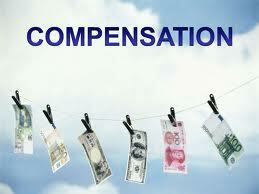 The basic purpose of compensation management is to establish and maintain an equitable wage and salary structure. It is concerned with the financial aspects of needs, motivation and rewards. Managers, therefore, analyze and interpret the needs of their employees so that rewards can be individually designed to satisfy these needs. Consideration for which labor is exchanged is called compensation. Compensation is what employees receive in exchange for their work. It is a particular kind of price, that is, the price of labor. As any other price, remuneration is set at the point where demand curve for labor crosses the supply curve of labor. Compensation can be in the form of cash or kind. Compensation may be defined as money received in the performance of works, plus the many kinds of benefits and services that organizations provide their employees. Money is included under direct compensation while benefits come under indirect compensation and may consist of life, accident, health insurance, the employer’s contribution to retirement, pay for vacation, and employer’s required payment for employee welfare as social security. A wage is compensation. It is the remuneration paid for the service of labor in production, periodically to an employee or worker. Wages form that part of cost of production, which is attributed as compensation paid to labor. Wage usually refers to the hourly rate paid to such groups as production and maintenance employee, who are also called blue-collar workers. On the other hand, salary refers to the weekly and monthly rates paid to clerical administrative and professional employees, managers and supervisors (white-collar workers). Salaries are paid in the form of time rate, mostly on monthly basis. Wages and salaries are also affected by psychological, sociological and ethical factors. People perceive the level of their wages as a measure of themselves. They may or may not take pride in the amount of their paychecks. People view wages as a measure of interpersonal status, prestige, and values. Pay differentials serve to depict social hierarchies. Compensation: Compensation may be defined as money received in the performance of works, plus the many kinds of benefits and services that organizations provide their employees. Money is included under direct compensation while benefits come under indirect compensation and may consist of life, accident, health insurance, the employer’s contribution to retirement, pay for vacation, and employer’s required payment for employee welfare as social security. Wages: It is the remuneration paid for the service of labor in production, periodically to an employee or worker. Wages form that part of cost of production, which is attributed as compensation paid to labor. Salaries: Salary refers to the weekly and monthly rates paid to clerical administrative and professional employees, managers and supervisors (white-collar workers). Salaries are paid in the form of time rate, mostly on monthly basis. Fair wage: Employer fixes this. This level of wage varies form industry to industry. The main criteria are the capacity of payment. Fair wage is the wage above the minimum wage but below the living wage. Living wage: Living wage is one, which should enable the earner to provide for himself and his family not only the bare essentials of food, clothing, and shelter, but also a measure of frugal comfort, including education for his children, protection against ill health, etc. Nominal wage: Nominal wage is the wage received, which is expressed in terms of money received. Real wage: This is the wage or earning, which is expressed in terms of goods and services which can be purchased from the money received as wage. This also can be obtained by dividing nominal wages by cost of living index.